This salad was born out of super bowl leftovers. But there had been enough indulgence watching the game, and redemption was needed. Buffalo wings with bleu cheese, carrots and celery is amazing because it is a perfect spicy/creamy/crunchy combo. I don’t want to eat wings all the time though, so this salad is just the fix. Cauliflower is an excellent hot sauce vehicle, and I borrowed the method from Thug Kitchen’s delicious Buffalo Falafel recipe (CRUSH HUNGER BREATHE FIRE. Cracks me up every time.). Serves 4 as full meal salads, 8 as side salads. The grocery store was out of red cabbage, but that would have been a nice addition for more color and texture. Green cabbage instead of lettuce could make this more of a slaw. Cucumbers are a good add, and if I had some avocado that probably would have gone in as well. You could easily use 4 tablespoons yogurt and leave out the mayonnaise in the dressing. Blend buttermilk, bleu cheese, mayonnaise, yogurt, lemon juice, salt, and pepper in a blender. If you prefer a chunky dressing, whisk everything but the bleu cheese until smooth, then stir it in. Let the dressing sit for at least 30 minutes, longer if possible, to let the flavors mingle (resist adjusting the seasoning until after the rest). Preheat the oven to 425F. Toss the cauliflower with 1 tablespoon of olive oil, spread on a baking sheet, and roast for 20 minutes. Heat a small sauce pan over medium heat with the remaining tablespoon of olive oil. Add the flour, and cook while whisking continuously for 5 minutes. It should smell nutty, but not boil. Add half of the hot sauce and whisk until smooth. It will be very thick. Add the remaining hot sauce, water, and vinegar, and whisk until smooth again. Turn off the heat. Assemble the salads with lettuce, carrot, celery, red onion, chickpeas and any other veg you’re adding. When the cauliflower is done, toss it in a bowl with the hot sauce until thoroughly coated. Top each salad with ¼ of the cauliflower, and drizzle with dressing and an extra crumble of bleu cheese, if using. Serve with extra hot sauce for those who like a serious kick. 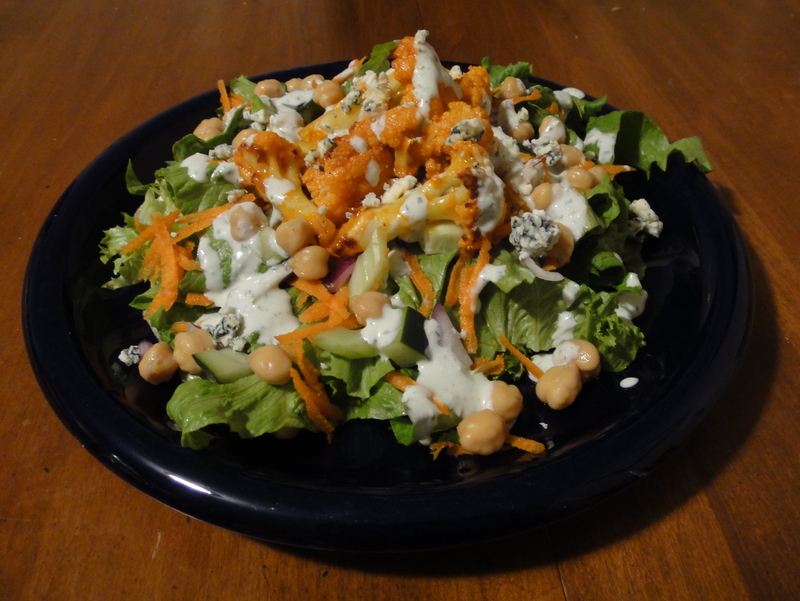 This entry was tagged bleu cheese, buffalo, cauliflower, chickpeas, hot sauce, salad, vegetarian, willitbuffalo. Bookmark the permalink.